Vienna, the capital city of Austria has a lot of history, music and a great cafe culture. If you are travelling with kids like us – be it toddlers or teenagers, don’t miss out on the museums – they have a variety of museums in Wein (Vienna in German). 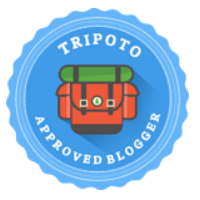 See our 3 day itinerary where we saw a little bit of everything. 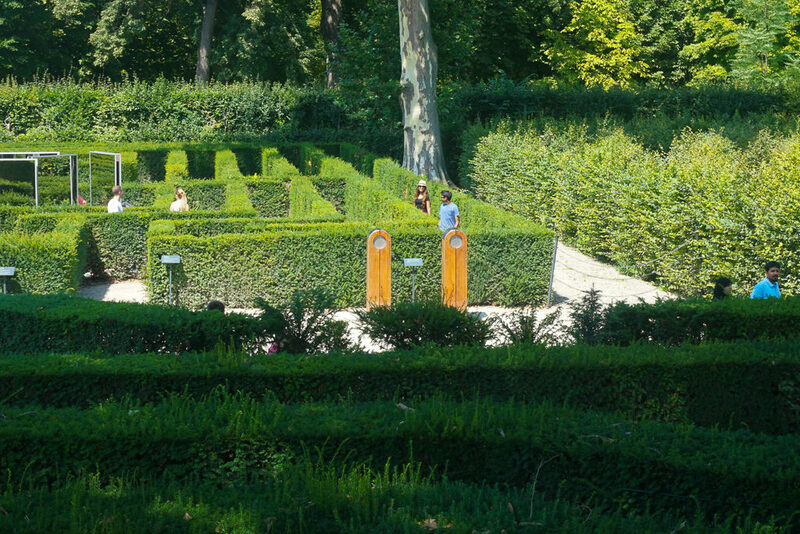 Exploring this culturally rich city, getting lost in mazes at palaces, listening to Mozart at the Golden Hall, admiring Klimt and eating all the Sacher Torte and Apple Strudel you can manage – here are the top things to do in Vienna with kids. 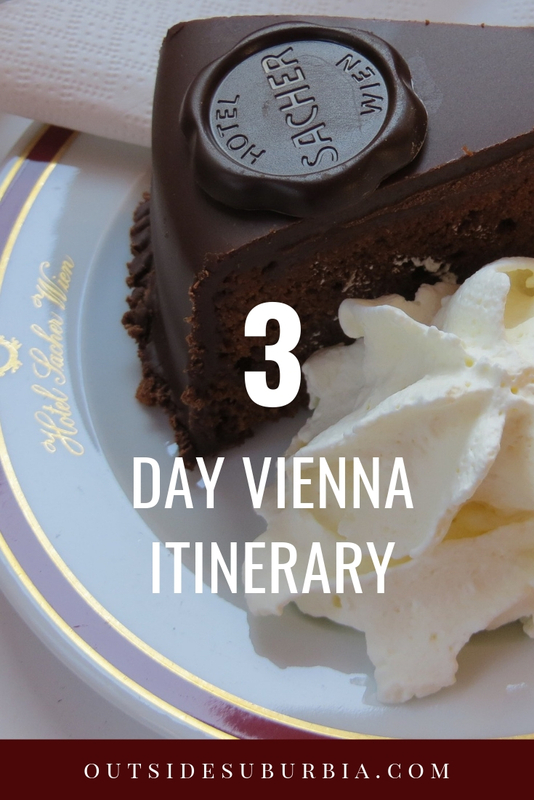 I have seen one day itinerary for Vienna, I’m not sure how they managed it, there is soooo much to do and see here. 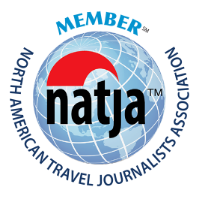 My advice is to plan for at least 3 full days, really 3 nights in Vienna for your trip. It’s known as a City of Music due to the many famous musicians and composers like Strauss, Beethoven, Schubert, Mozart and Brahms lived here. You must make it to at least one musical performance and a few museums if anything else! 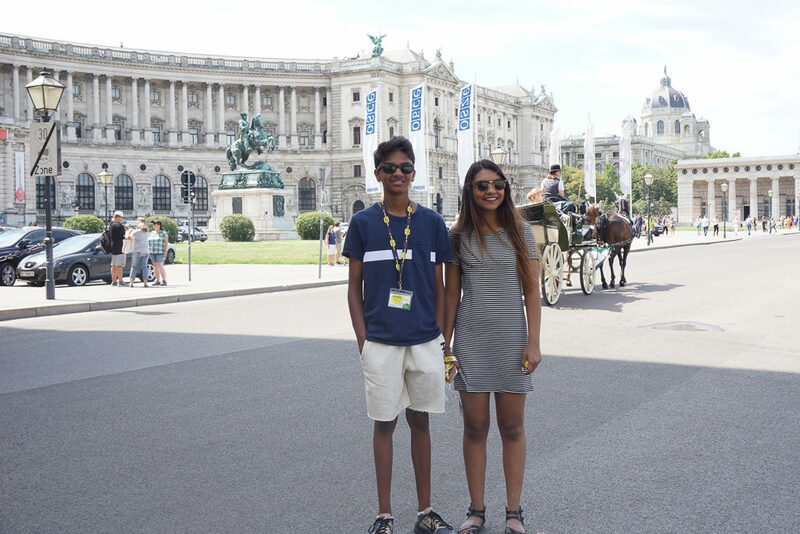 Day 3 – Stop at Naschmarkt, spend the day at the Schönbrunn Palace, kids can play dress up, visit the zoo or play hike and seek at the maze. Vienna has a huge and diverse variety of museums, plan just a couple of you will end up with a museum burnout. You will find there historical museums like the Natural History Museum, art galleries like the Belvedere, which was my favorite and the Albertina, as well as the House of Music and the Museum of Technology. You have to visit at least one or two of Vienna’s museums. The Belvedere consists of the Baroque palaces, the Lower and Upper Belvedere, it is an integral part of Vienna’s historic scene. 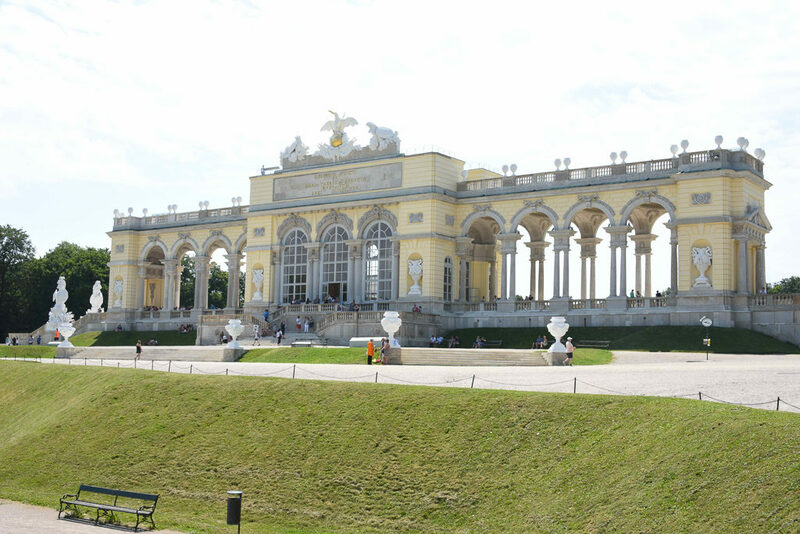 Prince Eugene of Savoy had the complex built for this summer home. During the French Revolution, the palaces served as home to French royalty fleeing their country. The Belvedere is stunning to look at during the night when it is all lit up, and well as provides great views of Vienna and house important works including masterpieces by Klimt. Tip: Don’t miss The Austrian National Library (Österreichische Nationalbibliothek), this baroque structure is the largest library in Austria, with more than 12 million items in its various collections. The library is located in the Neue Burg Wing of the Hofburg. It is stunningly elaborate and elegant reminiscent of a large church. Go to the State Hall on the second floor – it is the heart of the Austrian National Library, is one of the most beautiful library halls in the world, the biggest Baroque library in all of Europe. Among the exhibits are two exquisite Venetian baroque globes: one for the earth and one for the sky, each with a diameter of more than one meter. Unfortunately no pictures were allowed inside. Inside the Belvedere in Vienna and admire the most important collection of Austrian art from the Middle Ages to the present day, it is one of the most beautiful Baroque buildings in Europe and a UNESCO World Heritage Site. Originally this riding institution served to train of the riders of the royal family. Today, the Spanische Hofreitschule is the only institution in the world which practices classical equitation in the Renaissance tradition. It has been in existence for approximately 450 years, and the style of the uniform of the riders is nearly unchanged since the beginning. Only Lipizzaner horses, which are bred at the federal stud Piber in the Austrian province of Styria, are trained here. The Morning Exercise offers an insight into the years of training of the Lipizzaners and their riders. Accompanied by classical Viennese music the riders and their horses do simple relaxing exercises and exercises aimed at refining and perfecting a certain movement. The show takes places in the morning and is one of the popular places to visit in Vienna, so if you plan to attend buy the tickets beforehand. Make sure to check the schedule, they do take a break during summer months. Vienna’s important buildings are along this historical street. In the 13th century, Vienna was walled to defend this area that now comprises the first district of Vienna. After the First Siege by the Ottoman Turks in 1529, it was extended and a defensive slope was built around the walls. In the 18th century, the glacis(the defensive slope) served as recreation area, as Emperor Franz Joseph II commissioned the regeneration of this area by cultivating plants, installing street lamps and building walkways and roads. 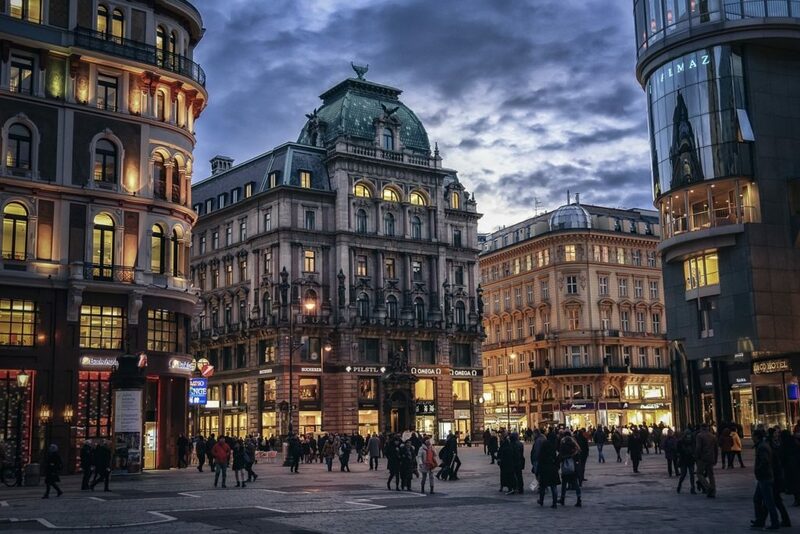 This former glacis, is called the Ringstrasse, and its surrounds the city center of Vienna, leading to several historical and the important buildings of that you want to see in Vienna. The Ringstrasse is basically the boulevard that surrounds Vienna’s historic center. The Votive Church, the City Hall, Europe’s largest theater (Burgtheater), the Austrian Parliament, the Vienna State Opera, to name a few are all on this area. 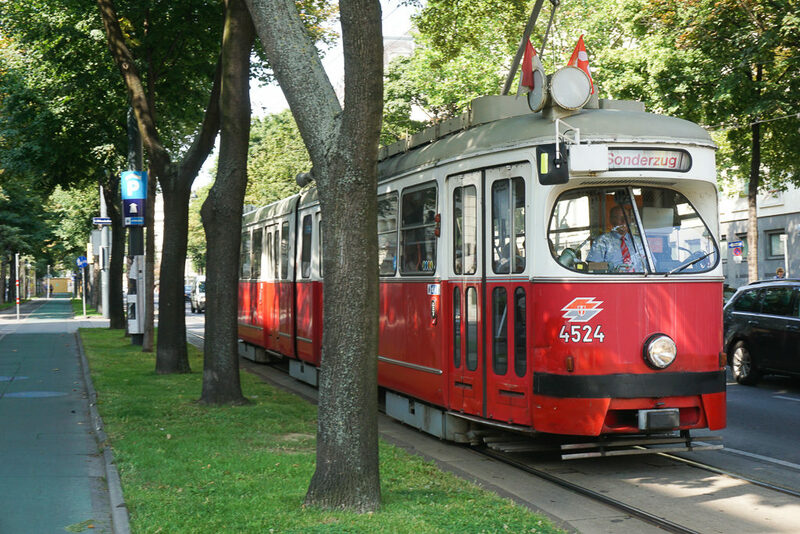 Although the best way to enjoy it is by tram, we had the Vienna Pass and used the hop on and off buses to get around. Our hotel was also located right on the Ringstrasse. 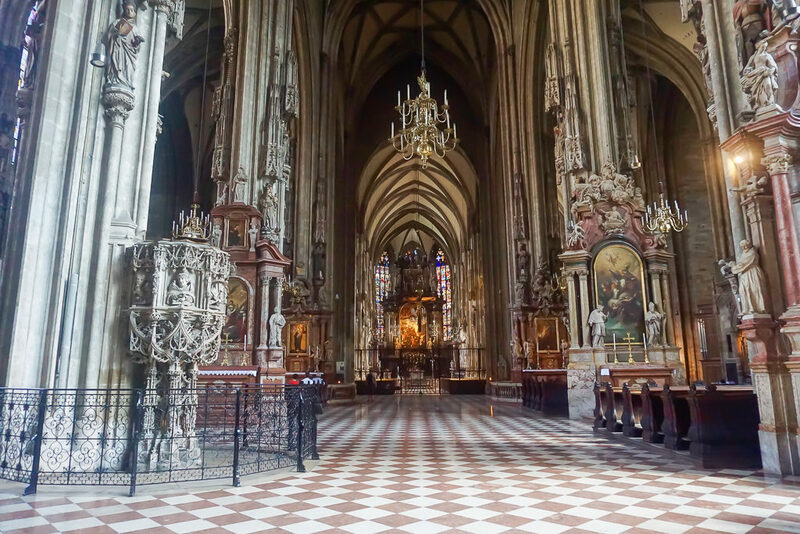 St. Stephen’s Cathedral, also known as Stephansdom, started out as a parish church in the 12th century. 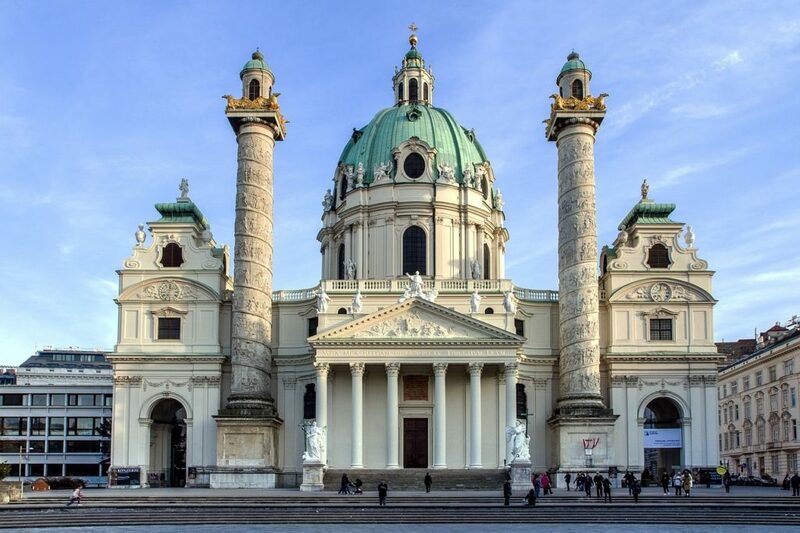 Today, it is the home church for the Catholic archbishop in Vienna. The church was destroyed in World War II but was rebuilt in seven years, with worship services still held daily. 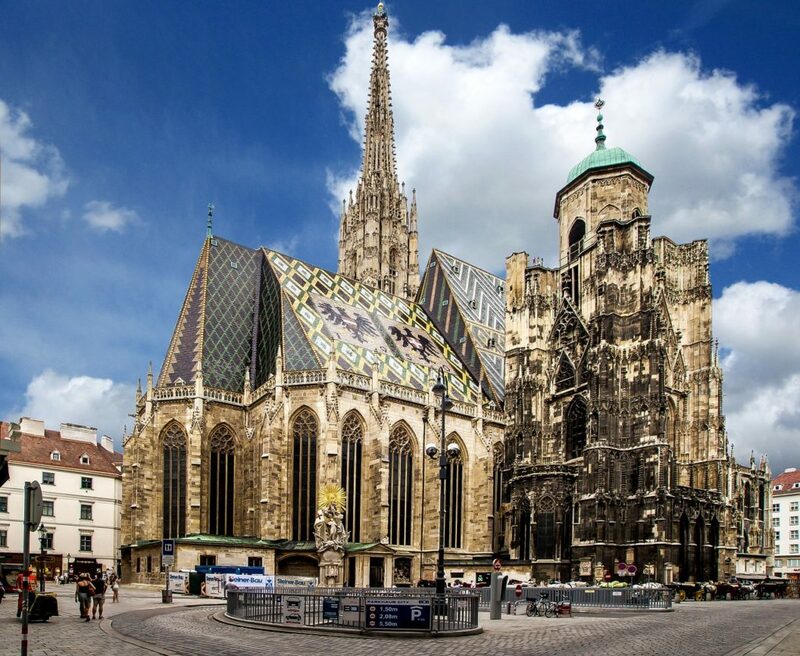 The cathedral, one of the city’s most important landmarks, its impressive roof is covered by 230,000 glazed tiles and reaches high into the Viennese skyline. The cathedral has more than 18 altars, all built at different times, and contains precious works of art as well. Two main pedestrian streets start here, the Graben and the Kärntner Straße. 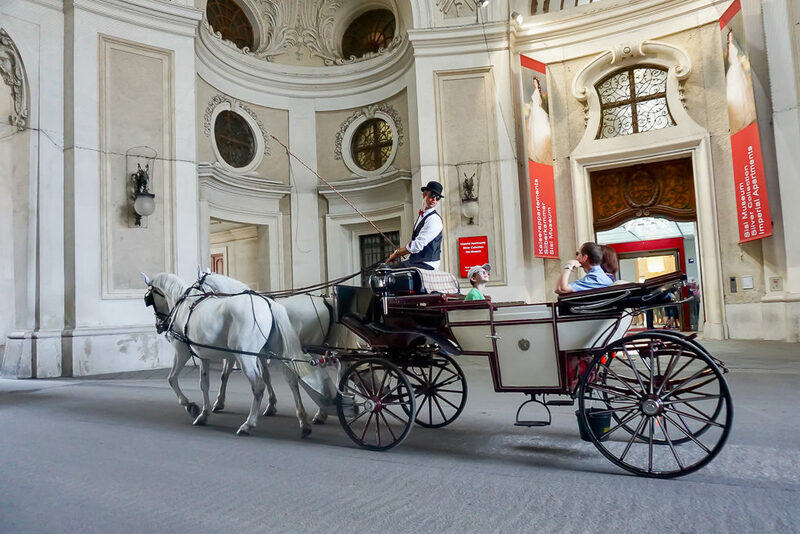 The first one will take you to the Vienna State Opera, the second one will take you, via the Kohlmarkt luxury shopping area, to the Hofburg Imperial Palace, and eventually back to the Ringstrasse. The Hofburg Imperial Palace has played an integral part of the Austrian government scene since it was built in the 13th century. 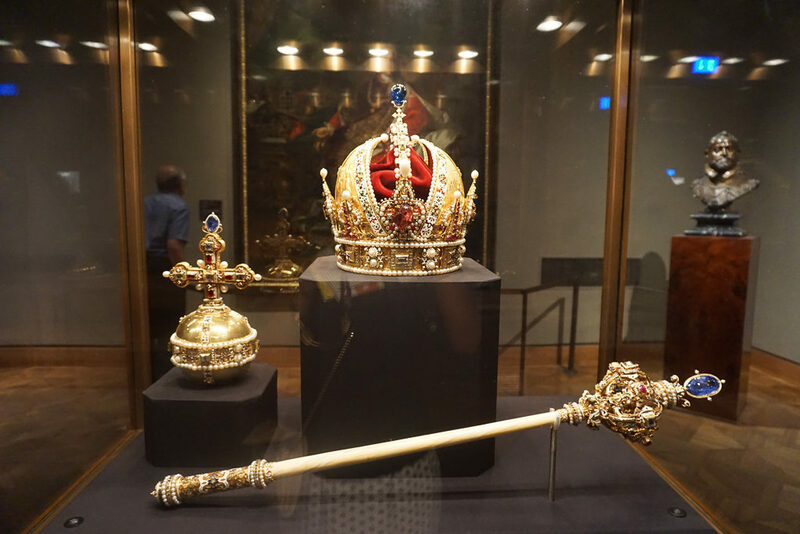 It has been home to some of Europe’s most powerful royalty over the centuries, including the Hapsburgs and rulers of the Holy Roman and Austro-Hungarian empires. Today it is a museum and home to the president of Austria. The Hofburg Palace is the current residency and workplace of the Austrian president, and it holds many important events like annual balls, ceremonies and congresses. It is located in close to St. Stephen’s Cathedral and Graben Street. The palace has numerous wings and halls built by various royalty over the centuries, but only three parts are open to the public today: the Imperial Apartments; the Sisi Museum, dedicated to Elizabeth, wife of Emperor Franz Joseph, and the Silver Collection, a collection of Imperial household objects.Empress Elisabeth of Austria, known as Sisi. Habsburg State Apartments and Sisi Museum . Empress Elisabeth of Austria, known as Sisi is a rare and fascinating character in 19th-century Austria. My daughter loved learning about the Empress. You don’t want to miss visiting this when you are in Vienna. Michaelerplatz (St. Michael’s Square) is the entrance gate to the Hofburg palace. The style of it is very similar to Hofburg. The horses and the carriages in front of it create quite a romantic atmosphere. Right behind the Hofburg palace is Burggarten, home to the Palm House with glasshouses, one of the most neglected photogenic spots in Vienna. There is a huge park where you can soak up some sun rays in the summer, or enjoy some Viennese coffee. 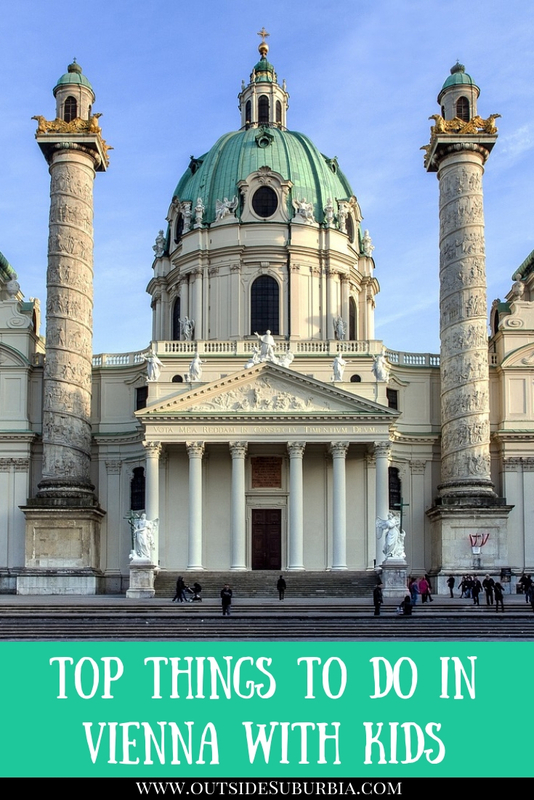 Add this to your things to do in Vienna! The city hall in Vienna is another one of the must-see places there. There is usually always something taking place in front of it – a Christmas market in the winter, a film festival during the summer months, or an ice rink right after Christmas. The Square of Maria Theresa is another very popular spot in Vienna that every single guide leads you to. Facing each other from both sides of the square are two almost-identical museums – the Natural History Museum and the Museum of Art History. 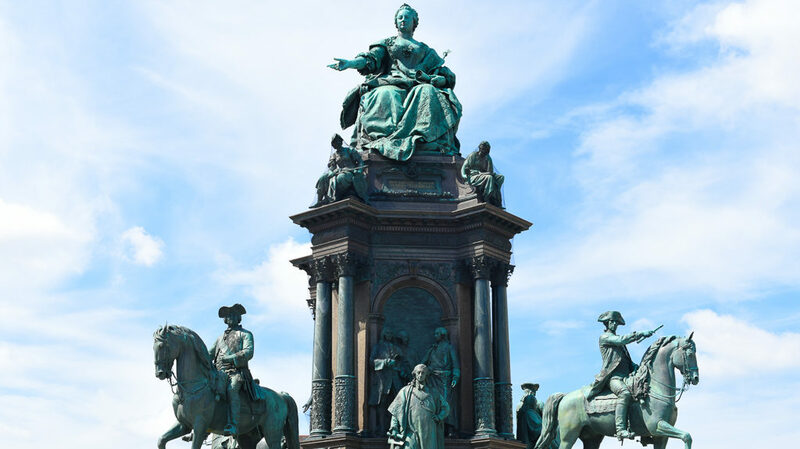 Right in the middle of the square stands a statue of Empress Maria Theresa, surrounded by beautiful green areas with a few benches where you can take a short rest between visiting the museums and enjoy the view. Vienna is famous for its musical history, the city was the birthplace of Strauss. both Beethoven and Mozart spent most of their adult life in the Austrian capital. A must do when visiting Vienna is to go to a classical concert. 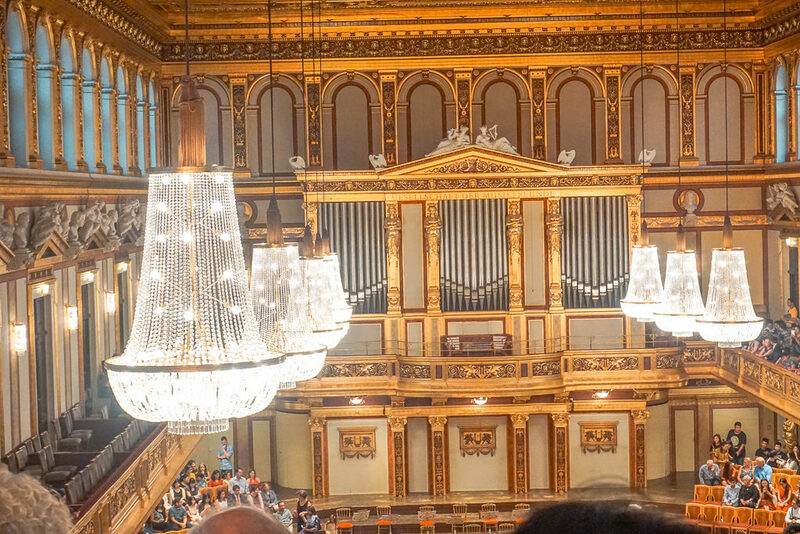 We went to a Mozart concert at the beautiful golden Musikverein. Konzerthaus, is another concert hall you can will find national and international musicians. This is the house of the Viennese Music Society and the place where the New Year’s Concert, with the Vienna Philharmonic Orchestra and one of the best composers of the world takes place. And for opera lovers, there is the Vienna State Opera, with excellent singers and performances. Opera and fine architecture is synonymous with Vienna, and the Vienna State Opera provides both in abundance. This outstanding building is located centrally in the Innere Stadt district and is considered one of the finest Opera Houses in the world. The exterior has a Neo-Renaissance style and is characterised by its many arches and arched windows, while the interior is extremely decadent and feels more like a palace than a place of musical celebration. The famous Viennese opera house is one of the must-see places for everyone visiting the Austrian capital. Its style and architecture make everyone stop and take a second look, no matter how many times they’ve seen it already. The interior is just as beautiful as the exterior. Daily guided tours are available which last around 40 minutes and give a good overview of the building. 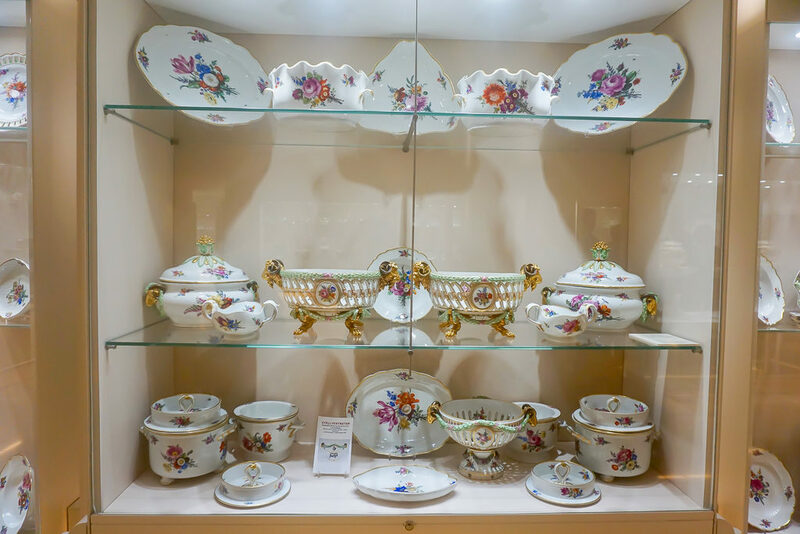 Whether you are looking for Wien Porzellan (famous for Porcelain) or brand name good you will find them at Graben, one of the most famous streets in Vienna. The word Graben means “trench” in German, and dates back to an old Roman encampment in the Austrian capital. Back in those days, Vienna was surrounded by a city wall, with a trench alongside of it. The trench was later filled in and became one of the first residential streets in Vienna. Craftsmen originally lived in wooden houses on the Graben, but it gradually evolved into a market place and later residences for the city’s elite. Today it is an up-scale shopping promenade that has Roles, Omega, Prada, Gucci and other stores. Originally conceived as a hunting lodge near the end of the 1600s, Schoenbrunn grew into the main summer residence of the Habsburg rulers. 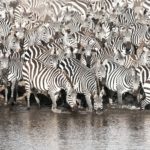 Besides the Baroque palace, there is an amazing garden, the Gloriette coffee-house and panorama point on a hill, the world’s oldest zoo, a maze, and a carriage museum. Little kids would enjoy the children museum here where they can dress up in costumes from the past, as well as learn to make apple strudel in a workshop. There is enough here to spend the whole day, we found plenty of things to do to keep us occupied. Do you spot my kids there? 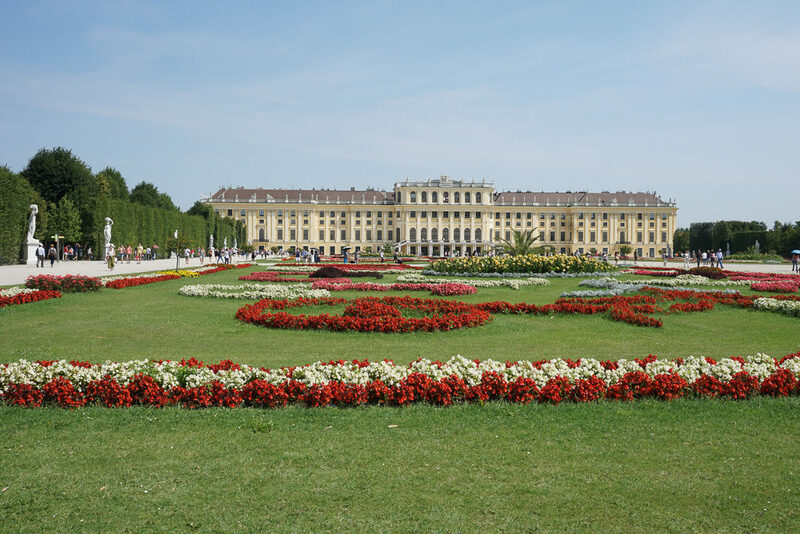 The 1,441 room Schönbrunn Palace is comparable in grandeur to Versailles, is one of the must see attractions in Vienna. The palace was built between 1696 and 1712 at the request of Emperor Leopold I and turned into the imperial summer palace by Maria Theresa. Vienna is famous for cafes and its pastry shops or Konditorei. The characteristic coffee-house tradition, is listed as an intangible cultural heritage by the UNESCO. So a trip to Vienna is not complete without drinking a coffee in one of the traditional coffeehouses. The attraction of these coffeehouses is the architecture and history, and many famous writers and artists were known to frequent them. 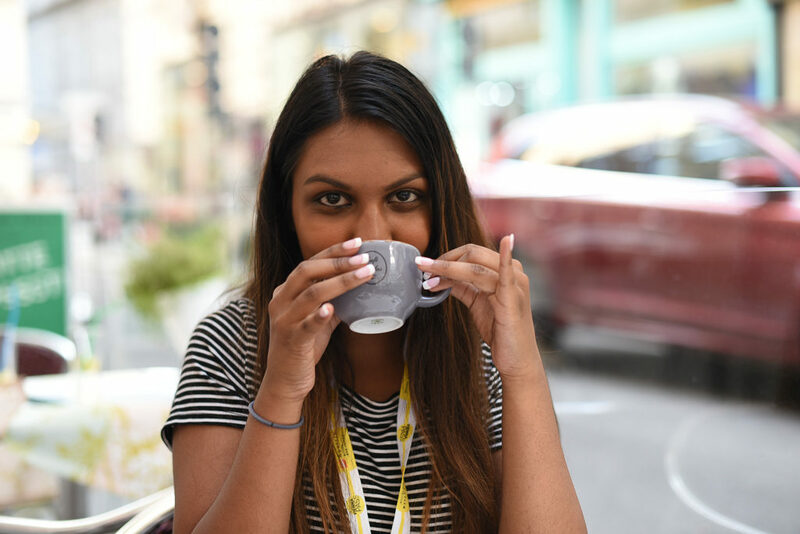 After ordering a coffee, these writers, artists and philosophers stayed for many hours, debating, reading the newspaper or writing, and this resulted in the city’s coffeehouse literature. Enjoy an Apple strudel or the Sacher Torte cake or your the choice of several delicious pastries with a coffee (ask for Wiener Melange if in need of a Cappuccino, and a Brauner if you want Espresso) – invariably accompanied by a glass of water. Enjoy an Apple strudel or the Sacher Torte cake or your the choice of several delicious pastries with a coffee (ask for Wiener Melange if in need of a Cappuccino, and a Brauner if you want Espresso) – invariably accompanied by a glass of water. 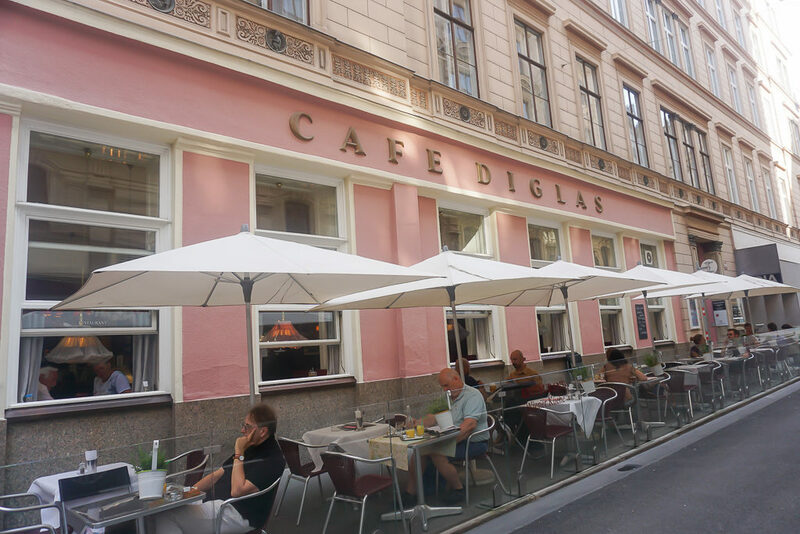 Our favorite was Cafe Douglas near the Cathedral, the coffee was strong, the apple strudel warm and the atmosphere cozy. Cafe Sacher is popular and there is always a line to get in. 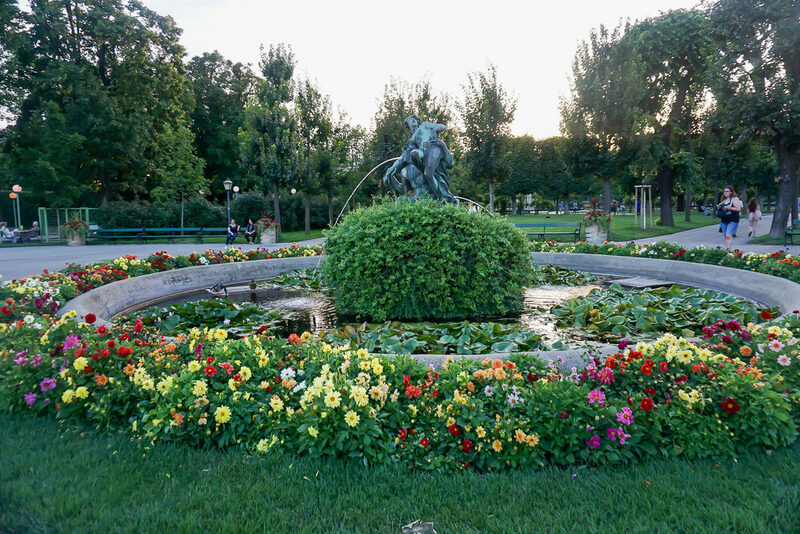 End your time in Vienna with a relaxing few minutes in the beautiful Volksgarten Park which literally means People garden and is perfect park for a stroll after all the museum hopping. It is right next the hobsburg. Just sit here around sunset and watch the fountains and the flowers. There are so many facets to the Prater experience, that I end up recommending it to everybody who visits Vienna. There’s of course the oldest amusement park in the world. Then, there is the Giant Ferris Wheel showcasing panoramic views of the city and even the option to have a romantic dinner there. 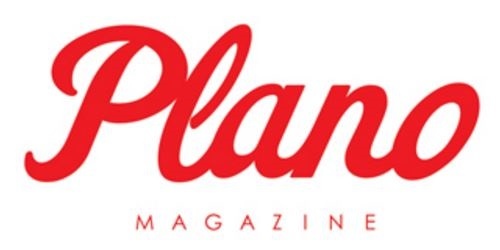 My favorite Viennese museum dedicated to chocolate (linked above), is located in the Prater and offers daily workshops by very passionate and knowledgeable specialists. 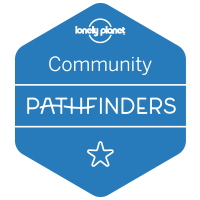 There’s even a Madam Tussaud’s museum and for outdoors lovers the Green Prater, a six million square meters area of lawns and woods traversed by a 4,5 km long straight boulevard, the Prater Hauptalle. Walk at leisure or take the small trains for a round trip through the park. 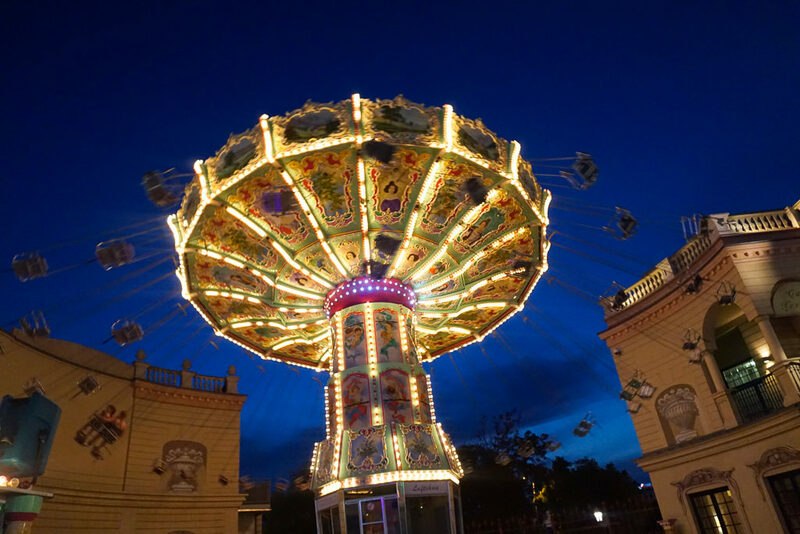 Vienna Prater is an amusement park a short tram ride from the Ringstrasse and is located in the second district of Vienna. The amusement park is just a small part of what is a big green space with lots of beer gartens and restaurants. The entertainment park offers a lot of activities, like rollercoasters, fun little trains, carousel and many more attractions which the young and old people will enjoy. We especially loved the Giant Ferris wheel and the old fashioned rides. There is also a chocolate museum, a mini train, Madame Tussauds and a planetarium inside. We ate at Schweizerhaus, a beer garden. Don’t miss Madame Tussauds inside Prater. With over 80 wax figures including the usual celebrities like Angelina Jolie, Michael Jackson to personalities from Austria like Emperor Franz Joseph and his wife Sisi, Wolfgang Amadeus Mozart, Falco, Maria Theresia and Gustav Klimt can be seen here. The city is so centrally located that you can get to a lots of places and visit as a day trip from Vienna – Prague, Salzburg, Slovenia, Budapest, Hallstat, Graz, Bratislava, Melk Abbey and Danube Valley are great options. 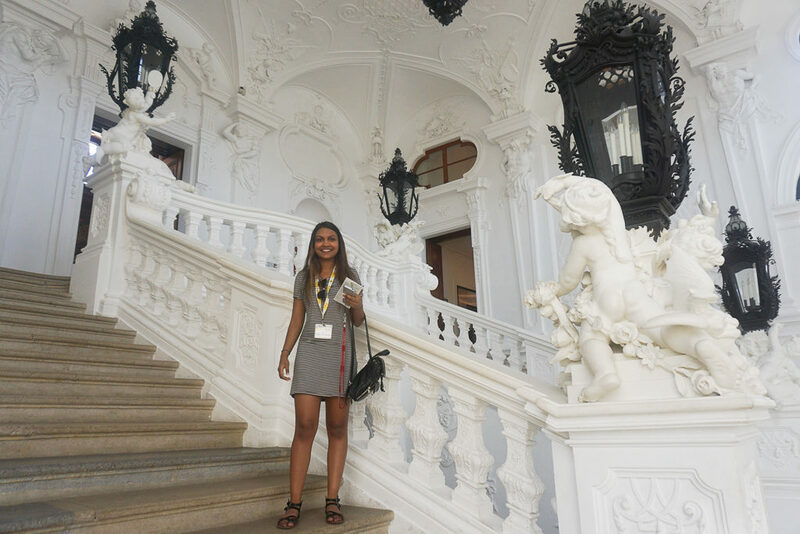 While we didn’t do any day trips, we picked up our car for our Alpine Road trip and stopped at Melk Abbey before heading to Salzburg, Zermatt and then eventually to Geneva. 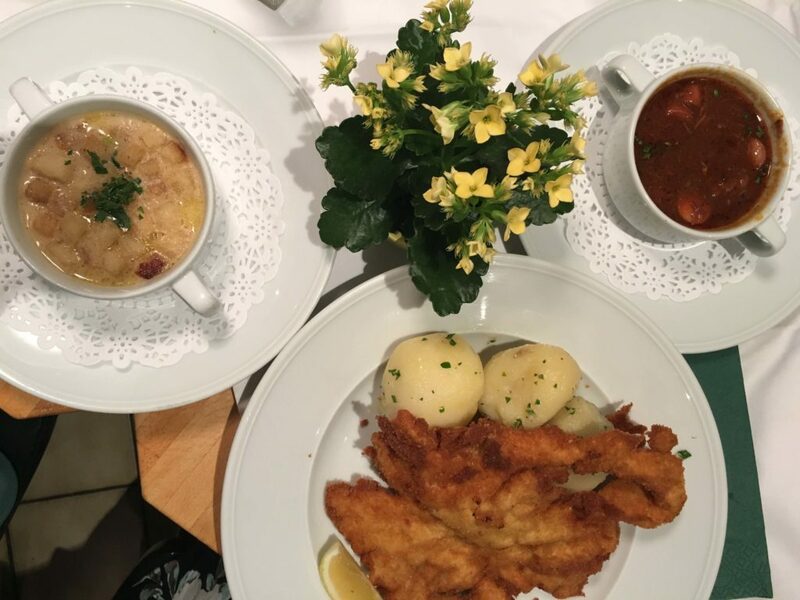 When in Vienna you must try the Schnitzel, pounded thin, fried to a crisp these buttery schnitzel are addictive. While Wiener Schnitzel is made from veal, you can also get a schnitzel in chicken or pork. Enjoy it with a side of Goulash, potatoes or fried chicory. 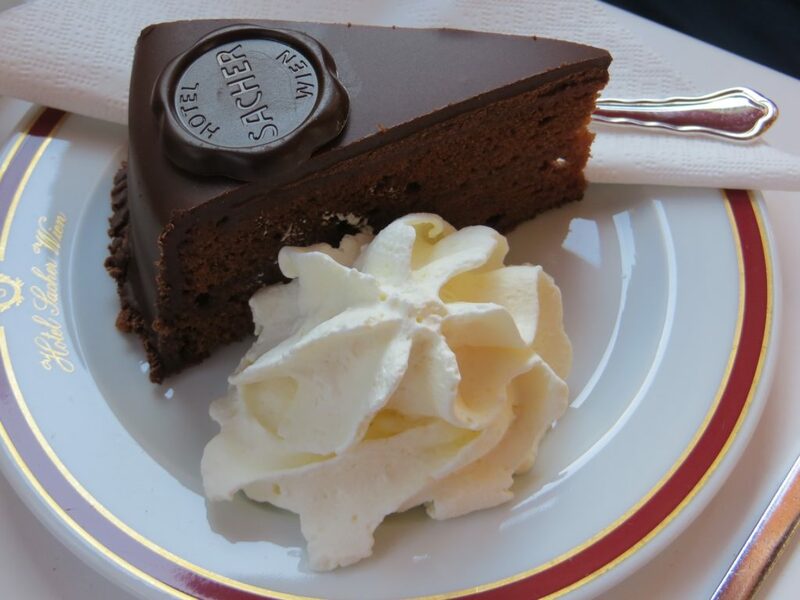 Finish with some Sacher Torte, make it to Hotel Sacher Wien for that authentic slice of chocolatey goodness! If you stay in a hotel on the Ringstrasse, you will be closer to most museums and attractions and you can make use of the Hop on Hop off tours. 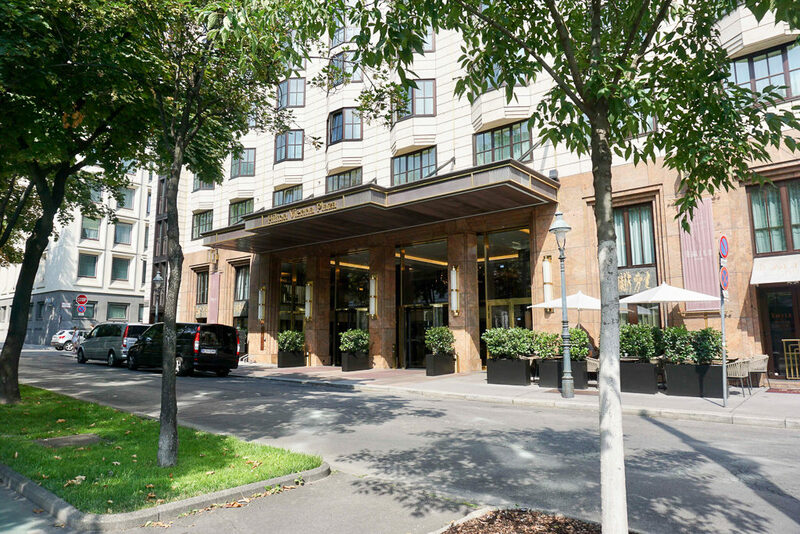 We were at the Hilton Vienna Plaza right on Ringstasse and it was also on the hop on hop off bus and tram route so getting around was easy. 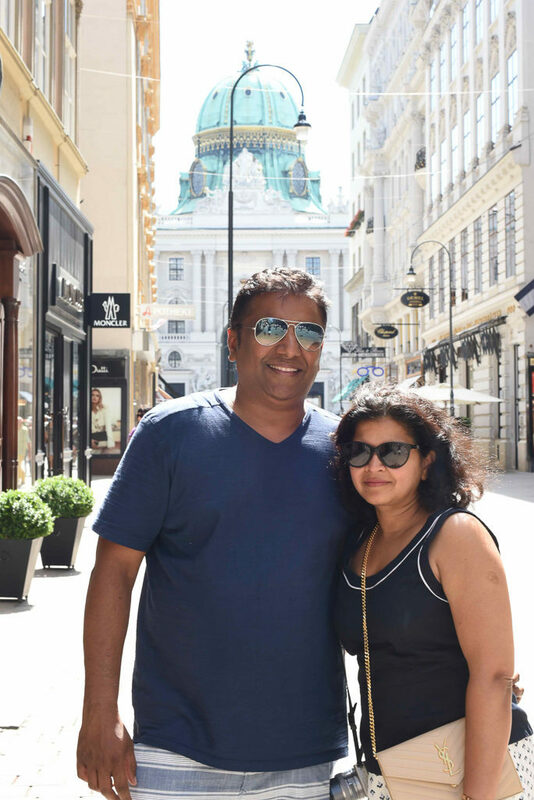 Couple of other options near by are Hotel Sacher Wien created and owned by Gurtler & Winkler family that created the original Sacher-Torte and Park Hyatt Vienna. 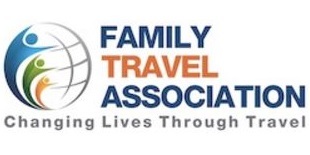 You can see other hotel options here and read the reviews. 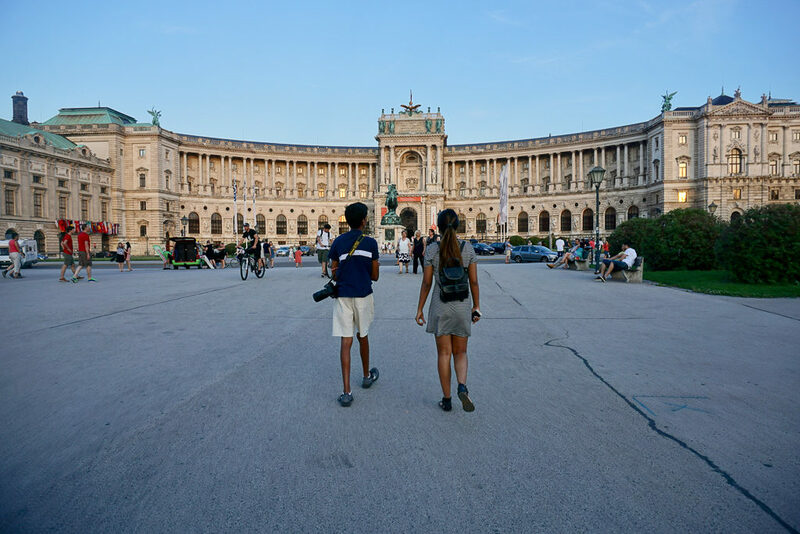 Hope you find this Guide for all attractions and fun things to do in Vienna useful when planning your trip to Austria. Great itinerary. I love Vienna. It has such a relaxed atmosphere and just oozes history and tradition. I could sit for hours in one of he coffee houses and just watch the world go by and chat to locals. Personally I would also add Naschmarkt to a three day itinerary. Either on a Saturday morning when the flee market is on or for lunch/dinner. It has such a great variety of foods, but local and from around the world. Small side note: the Wiener Schnitzel only comes in veil. Anything else can call itself a Schnitzel Viennese style, but not a Wiener Schnitzel. The name is protected. 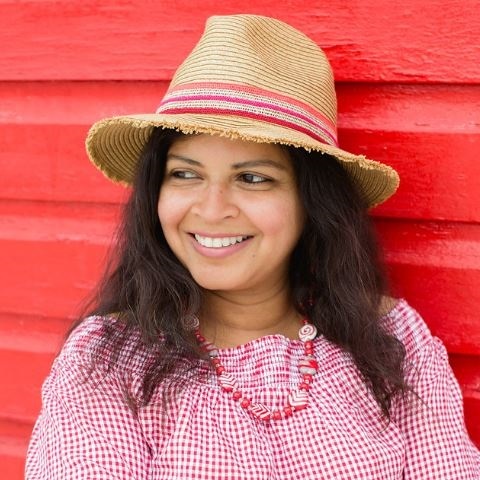 I loved your photos of Vienna Priya. I went there in December and my photos are so grey. I’m inspired to go there again in the beautiful summer. 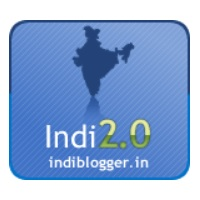 Thanks Kalpana, yes it was nice and sunny with beautiful days when we were there. Although I bet December with all the snow is just as pretty.. and those Christmas markets!